The Wednesbury Oak Loop aka Bradley Arm was originally part of Brindley's meandering Old Main Line but was by-passed by Telford's Coseley Tunnel. It's still partly navigable due to transporting water from the Bradley pumps and the presence of the Central Workshops at Bradley Lane where lock gates continue to be made. The area around Bilston was the birthplace of the Black Country. Small scale mining and iron smelting had taken place in the area for centuries before the Industrial Revolution owing to the proximity of coal to the surface together with iron, limestone and fire clay deposits. John 'Iron Mad' Wilkinson established his first works on Bradley Lane in 1766, by 1790 three quarters of the Black Country's blast furnaces were in the locality and Wilkinson's iron works and associated enterprises covered over 80 acres..
Cylinders for Boulton and Watt's steam engines, including the Smethwick Engine, were first made at Bradley. Output doubled when one was installed at the works in 1775 and coal instead of coke was used in the furnace. By adopting further new techniques such as puddling furnaces, Wilkinson made a fortune. If you could have walked along the canal from Deepfields Junction in the late 19th century it would have been lined with iron works: Capponfield Furnaces, Barbor's Field Furnaces, Bankfield Iron Works, Bradley Iron, Steel & Tin Works, Bradley Field Iron Works, Regent Iron Works etc etc. The wandering waterway served these concerns and encouraged further development. At the start of the walk, from the venerable old bridge at Deepfields Junction and under the railway line, you may think that you are still heading into the heart of darkness. But the canal quickly opens out with houses on the far side and adjacent parkland, and after a while housing takes over on both sides. Some of the old basins and wharfs are still visible but everything is now quiet. Following Banks Bridge the towpath improves from a muddy track and you enter a modern housing estate opposite one very large old factory and several smaller ones. Look out for the bricked up entrance by Pothouse Bridge (the site of a former pottery), this was the original line to Bradley Basin but was choked with traffic and the canal was straightened due to the pressure from Wilkinson's estate. .
Bradley Workshops occupy land where part of the Bradley Works once stood.. Since 1961, they have repaired and built lock gates, around 200 every year. It takes up to 20 days to make a gate, depending on the size, and there is no standard design. So each gate is hand crafted from English oak and weighs on average 3.6 tonnes. The canal would have run between the workshops and The Old Bush i.e. through the pub car park, crossing Bradley Lane and then to the side of the old tube works opposite. Any canal restorers will have to find an answer to the Bradley Lane problem but from then on it is relatively plain sailing as the canal that has been largely infilled and there are no major obstructions. Walkers have to turn left from the workshops along Bradley Lane and then quickly right through some concrete bollards and into a wide field. Above you on the right would have been the canal running parallel to the works. Walk along the well made path up the incline and you will eventually begin to follow the former tow path. The old 1770 main line would have soon departed, meandering along the contour off to the right from the former Batmans Hill Junction, however we follow the route of the canal after it was straightened (as with other parts of the BCN this meant that the old main line formed a loop) and you will soon reach what was once Bradley Locks Junction (the canal would have continued to meet up again with the old main line loop a little further on). The Bradley Branch was opened in 1849 to connect with another short branch that opened in 1796 to serve Bradley Hall Colliery from the Walsall Canal. 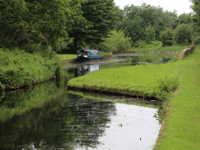 When they joined, a one mile link was therefore completed from the main line to the Walsall Canal and, as they are on different levels, an additional six locks had to be constructed. As you walk downhill, the locations of these locks can still be clearly seen. It is thought that they were just filled in when the canal was closed in 1961 and remain intact underground. Lock 7 was located just before the A4098 bridge, look over the bridge and a stream appears in the middle of an overgrown but identifiable canal. You pass locks 8 and 9, mothballed and full of the type of debris assocated with the Walsall Canal, and you can't help but think that the fate of any restored canal might be as a refuse disposal facility. However, following the Midland Metro bridge which towers over you, the path becomes a pretty walk adjacent to the Moorcroft Wood Nature Reserve. Not withstanding the fact that at this point the canal is wide, oily grey and overgrown, this is a pleasant stroll until you reach Moorcroft Junction and the Walsall Canal.